Golden Crossback Arowana is by far one of the most highly sought after arowana breed due to its brilliant gold color metallic sheen that shines when viewed under full-spectrum aquarium lighting. The fish is a favorite crossback species popular among arowana fanatics and because of its unique feature that projects an awesome display of coloration; no doubt it commands one of the highest selling price. The breed is graded according to its color intensity and what makes the crossback special is the line of golden scales that actually runs until the end of its body crossing the upper topmost scale (also called the 6th scale). 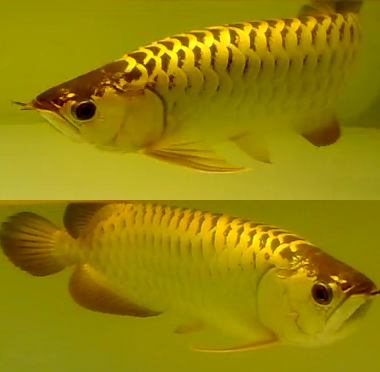 Golden crossback is actually an Asian variety of the arowana fish. Apart from the yellow gold color base, there is also the blue and also the green based of the crossback variety developed by experienced fish breeders. These days, with extensive cross breeding program undertaken by hobbyist, there is even a special variety which is called the 24K fully golden colored arowana. What makes this one truly remarkable is the absolute gold coloration covering the whole of its body and a quick glance would actually have you thinking on whether the fish was actually been painted gold. The variety first made its appearance couple of years ago in Malaysia and Singapore and today, it is one of the top high quality fish that could easily fetch few thousands dollars, sometimes even more. Another variety of the golden fish is the red-tailed golden arowana. Although somehow it is considered a lower grade specimen commanding a fraction of the price you would pay for a crossback, nevertheless they still share the same level of attention enjoyed by all arowana hobbyist. Unlike the crossback, the red tail only has golden scales showing on the 4th and 5th level and hardly goes above the 6th level and you can see the tail fins appearing slightly reddish. Acquiring a well-developed flawless specimen and finding one that fulfills the criteria of a perfect fish is indeed very rare (to certain extent exotic) as sometimes there is always a noticeable defect seen on every individual fish such as the dreaded drop eye condition happening on some of the maturing fish and the protruding jaw effect which can really hurt the overall aesthetic value. Also depending on the arrangement of the scales and proportion of its weight against the body length, a well-balanced type is always hard to come by and because of these factors; it has made the selection process even more delicate if you intend to find one matching your requirements. Sometimes in a pool of similar crossback arowana fry born from the same parents, each and every one can develop to become a unique individual fish and there are several factors like foods and nutrition, living environment, tank size, water quality with all playing a part towards the development process.